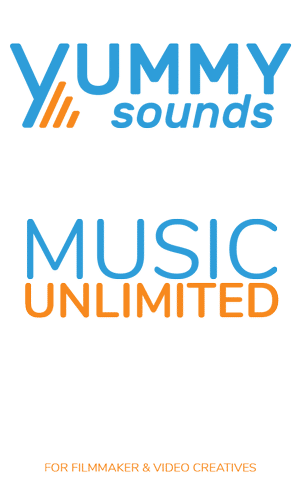 UNLIMITED MUSIC – FOR FILMMAKER! You want some more Free Downloads? Get more Free Downloads & Updates with our Newsletter. Keep up the great work with yummy sounds, can’t wait to listen to all music future holds. Also amazing support by Jasmin, about my questions on the licensing. 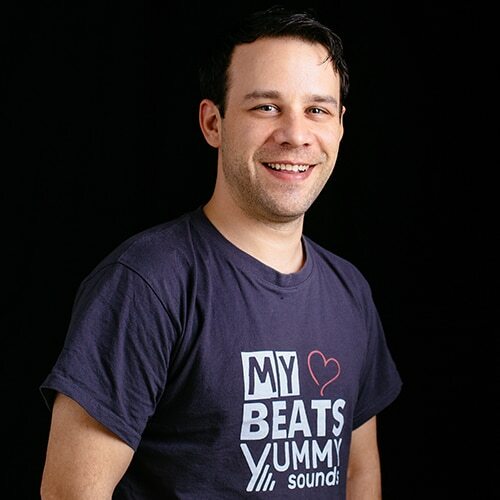 When I found Yummy Sounds, it was long before I found exactly what I was searching for. I should have started with this website. I won't be going elsewhere from now on. Fantastic selection of music. You want to know what Royalty Free Music is? Royalty Free Music is an audio file which is not registered with music copyright protection companies such as GEMA (GER), AKM (AUT) SUISA (CH) or BMI (USA). This type of music is free from royalties (license fees or income for each future use after purchase) that third-party copyright protection organizations or copyright collecting agencies control. That means that the copyright owner (mostly the actual producer) is responsible for all copyright protection and usage for his clients. 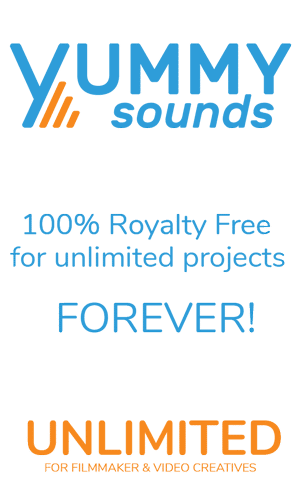 Royalty Free Music is perfect for all people and companies because they can use it without paying extra fees after purchase and they don’t have to worry about this type of music getting copyright claimed by some legal person or company owners. Once the Royalty Free Music item is purchased the customer or license holder has the right to use this item in his end-product lifelong without paying any fees or commissions. Wikipedia Quote: Royalty-free, or RF, refers to the right to use copyrighted material or intellectual property without the need to pay royalties or license fees for each use or per volume sold, or some time period of use or sales. You will find a large number of Royalty Free Music websites. At most online shops you’ll instantly find a lot of music with different styles and some of them provide good search engines. On most commercial platforms you have to pay a license fee for the music you would like to use in your commercial projects. Before you leave this page have a look in our library, we might have the perfect music for you! Why is Royalty Free Music not Free of Charge? There is some music on the internet which is free of charge. Mostly distributed under a “Creative Commons” (CC) license and is not the same as “royalty free” music. The “creative commons” music is mostly not high quality music and you should be careful when using it! The Creative Commons license is a special collection of licenses made up for media recourses such as images, music, video clips etc. This type of license became important to all sorts of media creators, to make sure their content is used by their permission or based on the licence conditions only. In fact: If you want to use a media resource which runs under Creative Commons you have to check which of the Creative Commons licenses the artist is using. After that, make sure that you follow the conditions. Let´s say you download some Creative Commons music and use it in your YouTube video. After a while, the owner/producer of that music could switch this music track from the Creative Commons to a Royalty Free system. Now this music becomes only legal to use by holding a user license. So, you might have to go to court when he/she decides to report you to the legal authorities for not having a proper license. I have seen this happening many times. Note: Never use any media output without having documentation about the items you’ve downloaded from somewhere! Who are typical consumers that use Royalty Free Music? Agencies which create videos or animations for end-customers. Cinematic, film, TV and radio broadcast production studios. Motion, photo and VFX designers. Companies with in-house visual production studios. Our licensing system is easy to understand. It is simple to use and is connected with all our music items. In order to choose the correct license, you should simply ask yourself what your media output will be like. For all commercial and private usage we provide three different license options with different rights to use the music. We’ve tried to keep it as simple as possible, but if you still have any questions about it, don’t hesitate to send us your inquiry. 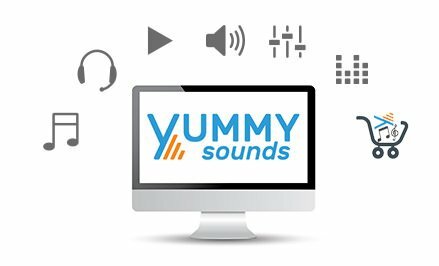 How About the Roaylty Free Music of Yummy Sounds? Our entire music library exclusively contains Royalty Free Music and every music item comes with a fair and easy to understand license. It’s very important for us to create strong customer satisfaction and to develop a decent and reliable online environment for all of our clients around the world. We love to help any customer whenever he/she needs us. We believe that a successful relationship can only exist with a high level of respect and trust. The “Importance” of Buying Royalty Free Music? Whenever you buy Royalty Free Music from the internet, always take a good look at the licenses. First of all, the license should cover all of your preferred usage. It also needs to be fair for both parties; the seller and the buyer. If you aren’t sure about something, always contact the seller or distributer and ask them about the licensing and your protection. Is This Music Free From Copyrights? No! Every piece of music comes with copyrights. Some music is considered a part of the public domain but there are still copyrights on this music. The copyright for any work of art (for example: paintings, songs, etc.) cannot be sold, given away as a gift, etc. Public Domain: The status of a literary work or invention whose copyright or patent has expired or that never had such protection. Let’s imagine that you have painted a picture. You will always be the copyright owner. You can sell the picture with exclusive rights but you will always be the painter and this will not change, forever! 70 years after death of the artist, the artwork will become Public Domain but the copyright always belongs to the actual creator/artist. A lot of people might think Royalty Free Music is lower quality. We want to prove this wrong and show that the opposite is actually the case. Our database contains high quality music and all items have at least the same output data that a common CD or DVD contains. We have a better sound quality than any radio broadcaster or TV station can provide. All our music content is made with professional software and high-end equipment by professional studios and sound designers around the world and every single music item is handpicked! There are advantages to using music from royalty free databases. The most important is the freedom of usage. This means that as long as you hold a license (also see below) you can use the music everywhere you want without thinking about claiming issues. No private or government based company has the right to make any claims on your media output which has been created with our music items. So, this means: You are SAFE against any third-party claims; even on YouTube, Vimeo, TV or radio broadcasts. You only have to pay once for the license and can use the music lifelong. You get full support from Yummy Sounds if you run into any trouble. 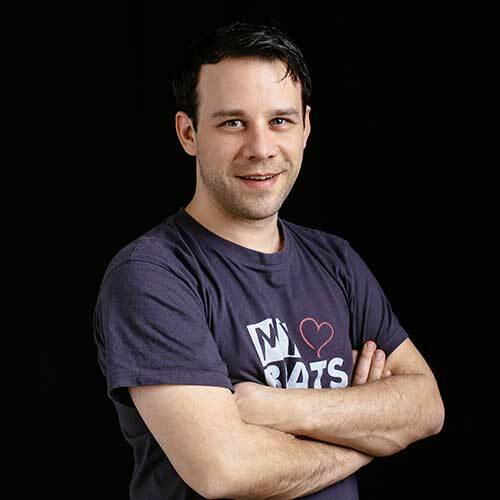 You receive a proper invoice and a high quality music download. You receive a document which grants you usage of the items. You can upgrade the license any time you want. We provide High Quality Royalty Free Music for Filmmaker and Video creatives to enlight there Film and Video productions with the best possible music, intros and Jingles.